Archbishop Charles Chaput, left, speaks with Brian Roberts, CEO of cable TV giant Comcast Corp. Even a year and a half in advance, excitement isn’t lacking for the 2015 World Meeting of Families in Philadelphia and the possible visit to the city by Pope Francis. What is lacking is money and manpower. 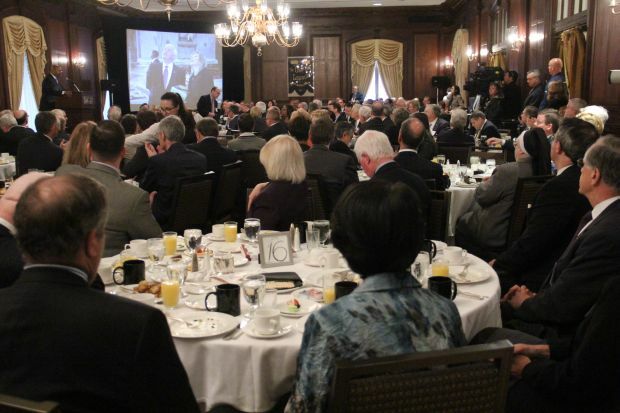 For that reason about 160 of the region’s most influential business and civic leaders were invited to the venerable Union League of Philadelphia April 15 for breakfast and to hear a chorus of pleas for help in raising tens of millions of dollars and thousands of volunteers. 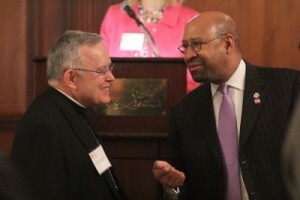 Archbishop Charles Chaput and event cochairmen Pennsylvania Gov. Tom Corbett and Philadelphia Mayor Michael Nutter led the calls for help in making the event a success. Officials with the World Meeting of Families emphasized the biggest need now is to raise the money to welcome some 20,000 people for the six-day event with conferences beginning Tuesday, Sept. 22, 2015. The contingent will consist of delegates and their families from 150 countries and up to 2 million people attending the closing Mass on Sept. 27, 2015, that organizers hope will be celebrated by the pope. 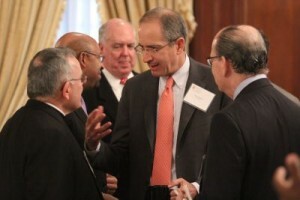 Philadelphia Mayor Michael Nutter speaks with Archbishop Chaput at the April 15 meeting at the Union League of Philadelphia. Archbishop Chaput said plans for a papal trip including one to Philadelphia typically are not announced until four to six months prior. But because Pope Francis routinely draws 50,000 people for weekly audiences at the Vatican and about 3 million came to celebrate with him at World Youth Day last year in Rio de Janiero, a visit to Philadelphia is “something we can’t wait to plan six months out,” Archbishop Chaput said. Using the figure of $54 million raised in 2000 to host the Republican National Convention in Philadelphia as a guide, planners for the 2015 meeting hope to raise a similar amount in the next year. At a session with reporters after the breakfast meeting, the archbishop said planners would soon develop a budget that would project costs “as though we’re paying for everything.” Then as funding comes in from private and government sources, costs such as security and transportation would be crossed off the budget. Another need is for volunteers. Donna Farrell, executive director for the 2015 World Meeting of Families, said 5,000 volunteers helped with the last such meeting in 2012 in Milan, Italy. But she expects to need 7,000 volunteers in Philadelphia. Pennsylvania Gov. 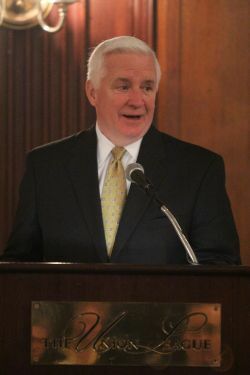 Tom Corbett makes a point during his speech to the invited guests at the leadership breakfast. Archbishop Chaput said the volunteers will be recruited from the public at large through a future website initiative and from the leaders of the business community represented at the breakfast meeting. But he and other leaders said many people from throughout Pennsylvania, New Jersey and Delaware have already expressed interest in volunteering for the World Meeting of Families. The archbishop added that each of the volunteers will need to be screened and certified for security reasons, and trained in their tasks. Farrell expects some 2,000 journalists from around the world to cover the week-long event. She said they would be “shining a spotlight on Philadelphia,” a point echoed by Corbett and Nutter. Corbett said he is already discussing with Nutter how state and local agencies are cooperating, including how to delay an unspecified PennDOT road project in the city scheduled for fall of 2015. State police, SEPTA, federal Homeland Security and Secret Service, plus Vatican officials, also will enter into the regional coordination efforts. The excitement for the event was palpable at the breakfast meeting. One member of the WMoF’s executive leadership team, Comcast CEO Brian Roberts, said that although he is Jewish he wanted to get involved in the event because of what it means to Philadelphia. In addition, Neubauer sees good signs from the event’s host, the Catholic Church. “When I see leadership changing the organization, and changing it for the good, I want to support that,” he said. Hilferty told the guests that members of the executive team “will be in touch” with each of them to ask for financial, logistic and volunteer support.